AD Waters brands had three nominations at the 2018 DPHA product of the year awards in both the Fixtures and Water Delivery categories. 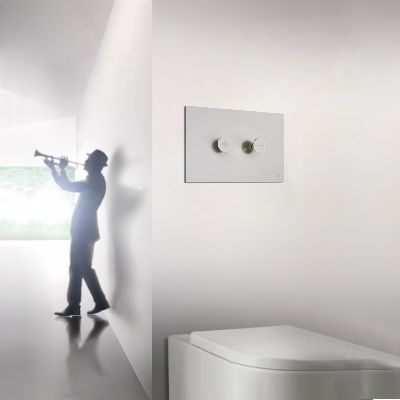 The first flush plate of its kind-The TRUMPET- was designed by world renowned architect Siza Vieira. The design was truly inspired by a real trumpet – the soft-press pneumatic pistons perfectly characterize those of a trumpet. With a stainless steel and extra-thin plate, this water-saving dual flush pneumatic actuator can also be used for alternate installations up to two meters away from the cistern to optimize comfort. OLI is one of the largest manufacturers of toilet carriers and flush plates. Their 900 000 sq-ft state-of-the art facility in Portugal runs 24/7 to ensure a weekly production of close to 45 000 flushing cisterns and 64 000 mechanisms. It is the only carrier on the market to include a flush plate in the box, ready to be installed. UPC certified and backed with a solid 10-year warranty, reliability has been the pillar of their reputation over the years. Fiora, Spanish manufacturer, produces and designs matching solid surface shower bases, sinks and vanities. The textured shower bases designed for high-end aesthetic and everyday comfort and safety are offered in eight earth-tone colors – total white, cappucino, cement, black, off-white, cream, grey and wenge. The Easy-to-install series can be installed above the floor or flushed to the floor, for a more discreet look and/ or for an ADA-compliant design. 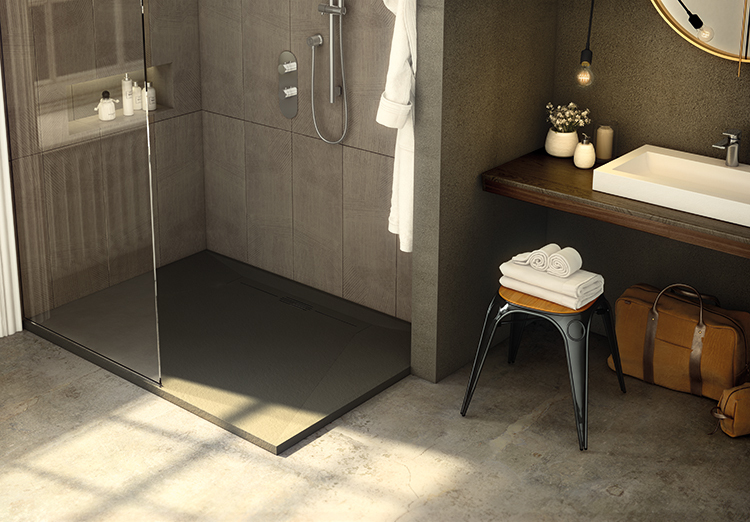 Extremely adaptable to virtually any space, Fiora’s shower bases can be cut on-site to fit within an odd size setting or to work around an existing structural element. Fiora shower bases offer reduced installation time and cost compared to tiled shower floors and limit chances of future water leaks. It’s proprietary Nanobath® technology prevents bacteria from reproducing (offering bacteriostatic properties), while repelling surface stains. The surface is finished with Fiora’s Metalface® technology which guarantees additional protection against damages and wear and the product is cUPC approved. Made in Italy, the new Aquabrass thermostatic TURBO TOTEM shower valve is a complete revolution for your shower experience. 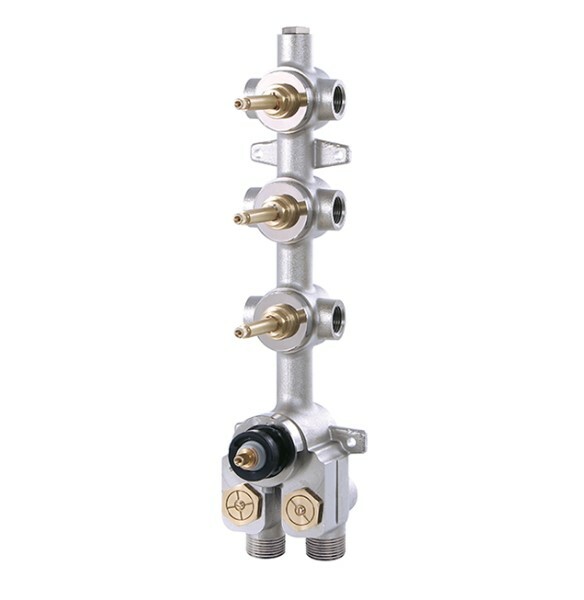 Designed with universal connections for either 1/2’’ or 3/4” water supplies, this thermostatic valve can process 12 GPM no matter the installation type. Installation is easy with water inlets located at the bottom of the mixing chamber, and if the hot and cold supplies are mistakenly inversed, the check valves can be reversed in minutes. Also, shower components can be connected either from the left or the right side, or even simultaneously, of this stacked valve giving maximum flexibility for your ideal set-up. If an extra independent shut-off valve is needed, the top part of the stack has a removable NPT plug. The numerous features integrated into the design of the TURBO TOTEM valve helps minimize stock for dealers, as one valve adapts to all applications with no need to modify existing pipes.